Nature is a great inspiration for your home’s design. In addition to the beautiful colors and themes that nature provides, it can also inspire the types of products you use. Here are 10 great ideas – from earth-friendly products to ways to save energy – that will help you keep nature in mind as you create a beautiful new space. A fresh coat of paint is an easy, budget-friendly way to add style and dimension to any room. And with Benjamin Moore® Natura® Interior paint, you can feel good about protecting the environment while you update your look-because Natura contains zero Volatile Organic Compounds (VOCs) and low total emissions. And because Natura is tinted with Benjamin Moore's zero-VOC Gennex® colorants, it remains zero-VOC even after tinting, regardless of color choice. As a Green Promise® - designated product, Natura has been tested by multiple independent third parties and meets or exceeds the most stringent environmental standards in the industry-without compromising the qualities you care about most. So you still get authentic Benjamin Moore color, exceptional durability and washability, and a product that goes on smoothly and easily. If you’re furniture has been sitting in the same place for a while, you may want to give it a new perspective. Try moving everything out of you room and slowing putting it back in. If your room was feeling cluttered, ask yourself if you really need each piece in the space. You may find pieces that will work in other rooms (see Shop for your home in your home) or you can save them for a spring yard sale. This redecorating trick has absolutely no impact on the environment. Did you know that bamboo can grow as much as two inches and hour? It is a renewable resource that can be replenished more quickly than trees. Bamboo has many uses – it can be used in fabric, furniture and accessories, and it makes beautiful floors. Bamboo floors have similar properties to hardwood floors and a unique look. Check out Carpet One Floor & Home’s Voyager collection for some great sustainable flooring options. If you’re making a major update in appliances, windows or doors, make an energy efficient choice. ENERGY STAR is a program developed by the U.S. Environmental Protection Agency and the U.S. Department of Energy to help you make confident choices when purchasing and energy efficient product. An ENERGY STAR label ensures that the product has met the strict guidelines created by the US Department of Energy. Choosing and energy efficient product can save you up to a third on your energy bills and limiting the amount of greenhouse gasses released. Want to encourage your family to recycle? Make it fun and easy. Find a space in your home that is easily accessible – a pantry, closet, entryway or space in the garage – and declare it your family’s recycling center. Make sure to add clearly marked containers for each type of recyclable material (plastic, paper, aluminum, etc.). There are lots of options from pop-up bags to stackable containers but for a sleek look that you don’t have to hide in the closet, we love the Three Compartment Step-On Recycling Bin from Organize It All. Earth-friendly and budget friendly, reusing items in your home is a great way to give your room a new look. There are several ways to bring new life to old furnishings and accessories. A fresh coat of paint can bring new life to a table or dresser – all you need is a weekend and a can of paint. Sometimes a new location can give you a whole new outlook on accessories – try moving things around until you find the perfect spot. Give a lamp and update with a new shade, try using the back side of a blanket or bedspread, the possibilities are endless. Spring cleaning season is here and what better way to spruce up a room than a good cleaning. Your chores can be earth-friendly too if you choose the right cleaning products. When you’re looking for environmentally safe cleaning products beware the labels. Without regulations for what classifies as “eco-safe” or “non-toxic”, they are just words on a label. Dig deeper, read the labels and do some research. If you want to make sure you know exactly what’s in your cleaner, try homemade cleaners. GreenerChoices.org has some great recipes. Window treatments make a room feel complete and they can also change the look of a room. Best of all, the right window treatments can save you money, keep you warmer in the winter and cooler in the summer. We’re in love with Vignette® Tiered Architella® Shades from Hunter Douglas. You’d never know by looking at them but these shades have clever fabric air pockets on the back that trap air creating an extra layer of insulation. You get the classic look of Roman shades, but behind the scenes, energy-efficient technology is at work. Pillows are always a great way to freshen your look without completely re-doing your room. You can change them with the seasons or anytime you are feeling like an update. This great collection from Pillow Décor takes garment fabric overages that would otherwise have been thrown out and turns them into beautiful décor for any room. The backs of the pillows are made from cotton. Wool is a natural, sustainable fiber with many great properties that make it perfect for home décor. Wool is a great insulator and it’s super strong and wear resistant. 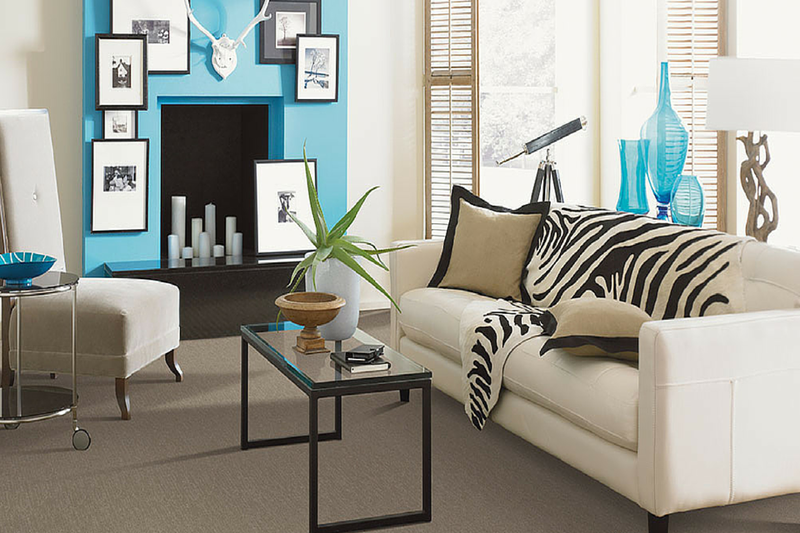 Different types of wool are suitable for different home décor items. For example, in wool carpet you’ll want a strong wool that will hold up to foot traffic. Check out Just Shorn wool carpet from New Zealand. Not only is the wool itself natural and sustainable but the growers of Just Shorn wool are committed to sustainable farming practices and the welfare of their animals.